SCI Healthcare’s surrogacy program is proven, many times over! With one more than 600 babies now home with their families, and another 100 on the way, it’s clear SCI Healthcare is doing a lot right! We can provide you with references from past and present clients, better still, read about our client satisfaction first-hand from the numerous online blogs praising our service. Dr Shivani Sachdev Gour and her team are one of the largest and most experienced IVF/surrogacy providers in India. Dr Shivani is “hands-on” – she performs all donor/client scans, egg collections and embryo transfers – she does not outsource this vital work to less experienced doctors. SCI Healthcareâ€™s embryology team is experienced and sought after by IVF and surrogacy centres across India. We enjoy a higher than normal positive pregnancy results with 75 per cent of donor egg/surrogacy clients achieving pregnancy on their first try. Ninety per cent of clients are pregnant on their second try, very few clients need to try a third time. Our miscarriage rate is lower than national and international averages. Our SCI IVF Hospital is brand new and equipped with the latest medical equipment. We are proud of the beautiful facilities we have created for the comfort of our surrogates, donors and clients. Our centre rivals the best private hospitals in the world in terms of medical care and comfort. SCI Healthcare follows the Guidelines for IVF and Surrogacy practice recommended by the Indian Council of Medical Research. In the absence of Indian legislation regulating surrogacy agreements, ICMR guidelines set out code of ethical standards our practitioners closely observe. Fast communication – we don’t keep you waiting. We understand how difficult it can be place your dreams of a family in the hands of a clinic in a foreign country. Most of our clients start the surrogacy process feeling alone and overwhelmed, but unwilling to give up what is, for them, a basic human need – to love and nurture a child. Rest assured, hundreds of couples before you have done just that and are now home with their babies. If they can do it, so can you! We have a team of more than 60 – there is always someone available to answer your questions. Every single client, past and present, has walked a difficult path in their pursuit of creating a family. Most of our clients have suffered years of infertility, or had repeated miscarriages and failed IVF treatment. We understand how difficult it is to have your baby growing so far from home. We provide regular test results throughout your treatment and pregnancy. We don’t keep clients waiting for news, there is always someone available to help you. SCI Healthcare has a large team to support you throughout your surrogacy journey, from start until well after you are home as a family. We are the only clinic to employ international client managers, who are either undertaking surrogacy with our clinic or are parents through SCI Healthcare. Our client managers have been where you are now, wanting a baby, with surrogacy abroad their only option. Trust in and rely on those who have gone before you. Our client managers remember all too well what it is like to feel alone and overwhelmed when facing the biggest decision of their lives. They are your first point of contact for anything you need throughout your time with us. We have the largest donor choice of any surrogacy provider in India. We have more than 65 young Indian women enrolled and willing to help our clients. We are also the only clinic in India to offer academic donors, young women who have post-secondary school education. You can view our donors profiles prior to enrolling without charge. We partner with several International EGG Donor Agencies who have Caucasian and other race donors willing to fly to Delhi to donate to our clients. We regularly accept shipments of sperm and embryos from clinics around the world. We trust only experienced shipping companies who have successfully delivered to us without issue. You do not need to wait to be matched with a surrogate. We have pre-screened surrogate mothers keen to get started. Once you have enrolled and have your test results to us, we can start your cycle. You could be ready for embryo transfer in as few as eight weeks. Embryo transfer must occur at exactly the right time. Dr Shivani cycles a group of surrogates at the beginning of a treatment cycle. When you, or your donor, are ready to start the active phase of treatment, stimulation medications, you receive surrogate profiles. You are only offered profiles of women whose cycles best fit your cycle or your donorâ€™s cycle. This gives you the security of knowing that the surrogate you choose will not have embryo transfer unless medical conditions are optimal. In the rare case of something not going according to plan and your surrogate mother is not ready for embryo transfer, we have other surrogates on the same cycle ready for transfer. This means your cycle will not be cancelled. We offer a basic surrogacy package and advise all clients of costs for services that may, or may not, be needed. Not all pregnancies run smoothly and sometimes there are unforeseen expenses. We understand our clients have budgets and we keep costs to a minimum. Our prices are lower than the Indian surrogacy clinics most frequented by international clients. When you are in Delhi, be reassured that you are not alone. Our concierge service will assist you with everything you may need including airport pick-up, private taxi services, the best prices for quality accommodation, places to shop and things to do and see. After birth of your baby we help in practical ways by loaning you baby items such as bottle warmers and sterilisers, and baby baths, and provide a low cost in-home nursing service. The past few years has seen rapid growth of SCI Healthcare as a growing number of clients from around the world seek IVF and surrogacy treatment. Due to the demand for our services, IVF and embryology treatment needed to be brought under the management of SCI Healthcare, and SCI IVF Hospital was born. 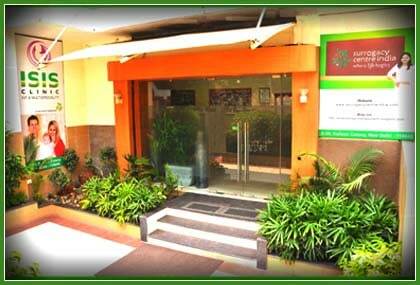 SCI IVF Hospital is a brand new multispecialty IVF centre spread over 500 sqm in Kailash Colony, south of New Delhi. The Hospital is located in walking distance from SCI Healthcare’s new administrative office near the Delhi Metro Station in Kailash Colony, an upscale neighbourhood in South Delhi. SCI IVF Hospital boasts of a brand new state-of-the art operating theatre, embryology laboratory, consulting rooms and four patient rooms. Dr Shivani Sachdev Gour and her team of medical professionals now perform all medical treatment, including donor and surrogate preparation, injections, scans, physical and pregnancy health checks, egg collections, embryology and embryo transfer, at SCI IVF Hospital. SCI IVF Hospital reception area , SCI Hospital waiting room, Thank you cards from clients around the world provide hope and encouragement to new clients of SCI Healthcare. No expense has been spared on comfort for our donors, surrogates and clients. Each patient room has brand new furniture, ensuite bathroom, colour television with cable access and visitor’s lounge.